As you can see my blog has now migrated to my new website. The website in itself is still under construction. Sorry for that guys! 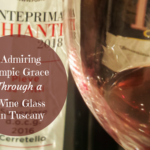 Where to start with my first post on my new blog other than talking again about the wines of Tuscany, and especially about Chianti Classico. There is a house…not in New Orleans, but in Radda in Chianti. That is where the Casa Chianti Classico (the House of Chianti Classico) is situated. 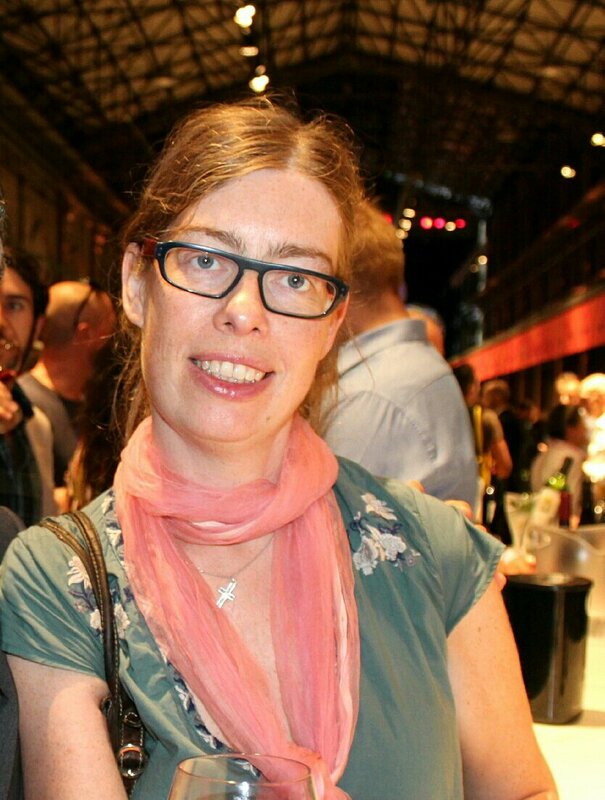 In this post I will talk a bit about a dinner I went to there with friends last week, and how we met a very nice Australian couple being there on holiday. It opened more or less a year ago, in the center of the village Radda in Chianti, which is also one of the main sub-areas of Chianti Classico. So if you are going to Tuscany for holidays, or if you live here, you should definitely pass by there for a glass of wine. The building is an old convent, Santa Maria al Prato, which have been renovated in order to host a completely new and different enocultural activity, i.e. the House of Chianti Classico. 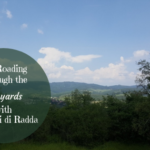 Some weeks ago I was telling you about the legend of the Gallo Nero (the Black Rooster), and by coming to Radda you can experience what it means to be in the middle of the area of the Gallo Nero. You can get a feel of the historical landscape, tour some of the local wineries and get a closer look at the vinification process, enjoy the stunning views and sip at a glass of red Chianti Classico wine at the terrace of Casa Chianti Classico. 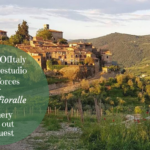 You can go there for a light lunch, for an aperitivo with live music, or perhaps for one of the many other events such as dinners with wine from different Chianti Classico producers during the summer. Last week my friend Lorenzo Sieni invited me and a couple of other friends to a dinner at Casa Chianti Classico. Lorenzo is the president of Fisar Firenze and his family also owns the winery Montefioralle which is situated close to Greve in Chianti. His winery together with the winery Montemaggio were presenting their wines at this dinner. The menu of the evening had been prepared by a chef selected also especially for this dinner event. It turned out to be a lovely experience. The tables had been set up in the middle of the cloister, and the wines had been put in evidence on a table in one section of the cloister. Both Lorenzo and his sister Alessia Sieni, the owner of their winery, and the representative of Montemaggio winery were invited to present and talk about their wines. They are both fairly small but historic wineries. The first wine we had for the evening was the Montefioralle Chianti Classico 2012. It is a wine with Sangiovese as the main grape followed by a small addition of Canaiolo and Colorino. It has a ruby red colour and aromas of mature, red fruit. It tastes also of red fruit as well as a hint of black pepper. You can also feel that it has been aged in oak barrels. We paired this wine with both the Crostini ai Fegatini and with the Panzanella con Pesto leggero di Basilico. This red wine paired well with the crostini, but was perhaps less suited for the panzanella with its raw vegetables. With the Tortiglioni in crema Tiepida di Fagioli al Fiasco e Gocce di Marzolino del Chianti I tried the Chianti Classico 2009 from Montemaggio. It is a wine based on Sangiovese and with a small amount of Merlot (5-7%) added. It has a ruby red colour and notes of flowers and red fruit. It is a full-bodied wine with a rich and elegant taste. The Chianti Classico Riserva 2011 from Montefioralle paired well with the Sella di Coniglio farcita in riduzione di Chianti Classico e Cacao con Patate allo Zafferano. This wine has the same composition as the Chianti Classico 2012. 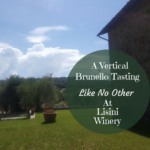 However, Alessia Sieni explained to us that they only select grapes from vines being 15 years or older and only a smaller amount of clusters from each vine than normally. It is a wine with a deeper ruby red colour and more intense notes of fruit, flowers and wood. It is a well structured and very elegant wine. The dessert of the evening, Bavarese alle Fragole con Spuma di Vin Santo e Cantuccini was paired off with a Vin Santo from the area. Have you already been to the Casa Chianti Classico? Tell us in that case your experience of Tuscany. This week there will be several blog articles coming, as an extra something to start off this new website. Stay tuned! Another wonderful tour of the Italian wine scene, and Tuscany is one region I for one would be excited to have the opportunity to visit. It sounds like everywhere you explore is equally as interesting and inviting as the last. Thanks for sharing an inside peek into the fabulous places and faces of Italy, Katarina. Keep enjoying! Your blog posts always make me want to travel. And drink wine! Thanks Carol, for the nice comment. 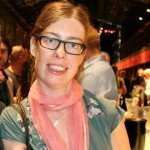 I like reading your wine tasting reports! Tuscan wines is a topic I don’t know much about. I did an oenology course in Paris, so I know most of French wines and Hungarian ones (due to my origins). But I love Tuscany and and I’m hoping to discover more and more about this wonderful region, its gastronomy and wines… Thanks for sharing! French wines are top wines, Hungarian are very nice too…they Tokaij is a really great wine. Every time I read one of your blogs I want to go where you have been & take up drinking wine. These wines sound amazing. I LOVE merlot (i only drink red wines) but i only like a wine if it isn’t too sweet! I long to return to Italy… It calls to me! Since returning to the States a year ago, I haven’t traveled outside of the Dallas-Ft. Worth metroplex and I REALLY am feeling that “travel bug”! 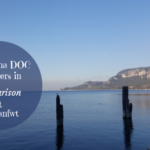 I love your posts so much Katarina – because it gives me a sense of living vicariously through you 🙂 Plus, your posts help point me in the right direction of new types of wine to try, as I am still very much a “beginner” when it comes to vino. I am still developing my palate. Funny how a wine that can taste “ew, that’s too dry!” can be “hey, pretty tasty!” just a few months later! What a beautiful location for dinner! (And wine, too, of course.) Quite the romantic spot. Good stuff! I look forward to reading your blog. I love to pour a nice glass of red and sit and enjoy and imagine I’m there. The pictures are lovely. It makes me want to travel. The wine bottles are begging to be opened. I look forward to visiting this place one day.